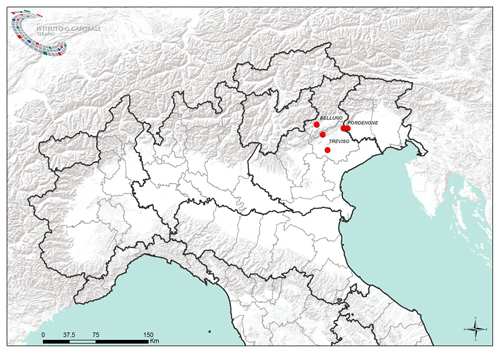 The presence of virus was confirmed in the vectors of the genus Culicoides in Italy, Belgium and Denmark: 6 pool (Obsoletus complex) collected from September 6 to 25 November 2011, three holdings in Veneto and Friuli Venezia Giulia, two pools (respectively C. obsoletus and C. dewulfi ) caught during the months of September and October 2011 in Belgium and Culicoides captured in October in Denmark. These results confirm the role of Culicoides in the transmission and spread of the SBV. To date animals from 7 herds were found to be positive for the Schmallenberg virus. 2 cattle and 5 goatholdings. There are 258 UK farms reporting SBV: 36 in cattle and 222 in sheep. There are no new reported cases since the 14 May 2012. We have adjusted some of the current total numbers for the counties where some premises lie close to a county boundary. This has no bearing on the distribution of infection when it occurred last summer or on our assessment of the risk of incursion of potentially infected midges from Continental Europe. It is a consequence of more detailed ongoing work following up affected premises in order to assess impact. In Germany animals from 1521 holdings have been tested positiv for Schmallenberg virus so far. The cases occurred in 621 cattle holdings, 853 sheep holdings and 47 goat holdings. Affected federal states are North Rhine-Westphalia (209 cattle, 270 sheep, 13 goat holdings), Lower Saxony (187 cattle, 144 sheep, 6 goat holdings), Hesse (56 cattle, 129 sheep holdings, 9 goat holdings), Schleswig-Holstein (75 cattle, 101 sheep holdings, 1 goat holding), Rhineland-Palatinate (1 Bison holding, 35 cattle, 41 sheep, 5 goat holdings), Baden-Wuerttemberg (6 cattle, 22 sheep, 5 goat holdings), Brandenburg (14 cattle, 21 sheep holdings), Thuringia (14 cattle, 30 sheep, 2 goat holdings), Saxony-Anhalt (8 cattle, 23 sheep, 2 goat holdings), Hamburg (2 cattle, 6 sheep holdings), Bavaria (8 cattle, 17 sheep holdings, 1 goat holding), Saxony (4 cattle holding, 35 sheep holdings), Mecklenburg-Western Pomerania (2 cattle, 9 sheep holdings, 1 goat holding), Saarland (4 sheep, 2 goat holdings) and Berlin (1 sheep holding). According to the French Ministry of Agriculture, the Schmallenberg virus was found in 1,623 farms: 1,126 sheepholdings, 478 cattle -, 17 goatholdings and 2 mixed holdings with goats/sheep. La pr&#233;sence du virus de Schmallenberg vient d’&#234;tre confirm&#233;e dans 152 nouvelles exploitations. Au total ce sont 1623 &#233;levages qui sont donc touch&#233;s dans 52 d&#233;partements (01, 02, 03, 08, 10, 14, 16, 17, 18, 21, 23, 24, 27, 28, 33, 36, 37, 39, 41, 45, 47, 49, 50, 51, 52, 53, 54, 55, 57, 58, 59, 60, 61, 62, 63, 64, 67, 68, 69, 70, 71, 72, 73, 76, 77, 79, 80, 86, 87, 88, 89, 95). Il s’agit essentiellement d’&#233;levages ovins, mais on compte 478 &#233;levages bovins, 17 &#233;levages caprins et 2 &#233;levages ovin/caprin. Testing of more cattle-samples from last year revealed positive results of 70% . It is not know yet how what % of positive cows had dead and/or malformed calves. Preliminary testresults indicate sheep in affected areas probably are positive for 70% or more. In Germany animals from 1539 holdings have been tested positiv for Schmallenberg virus so far. The cases occurred in 639 cattle holdings, 853 sheep holdings and 47 goat holdings. Affected federal states are North Rhine-Westphalia (223 cattle, 270 sheep, 13 goat holdings), Lower Saxony (187 cattle, 144 sheep, 6 goat holdings), Hesse (56 cattle, 129 sheep holdings, 9 goat holdings), Schleswig-Holstein (75 cattle, 101 sheep holdings, 1 goat holding), Rhineland-Palatinate (1 Bison holding, 35 cattle, 41 sheep, 5 goat holdings), Baden-Wuerttemberg (6 cattle, 22 sheep, 5 goat holdings), Brandenburg (14 cattle, 21 sheep holdings), Thuringia (17 cattle, 30 sheep, 2 goat holdings), Saxony-Anhalt (9 cattle, 23 sheep, 2 goat holdings), Hamburg (2 cattle, 6 sheep holdings), Bavaria (8 cattle, 17 sheep holdings, 1 goat holding), Saxony (4 cattle holding, 35 sheep holdings), Mecklenburg-Western Pomerania (2 cattle, 9 sheep holdings, 1 goat holding), Saarland (4 sheep, 2 goat holdings) and Berlin (1 sheep holding). Testing of cattle-samples from last year revealed positive results of at least 70&#37; . It is not know yet how what % of positive cows had dead and/or malformed calves. Italy confirmed the 8th case (cattle) of Schmallenberg; in total 3 cases in cattle and 5 in goats. Si tratta dell'ottavo caso di Schmallenberg nei ruminanti nel nostro Paese. According to the French Ministry of Agriculture, the Schmallenberg virus was found in 1,829 farms: 1,128 sheepholdings, 684 cattle -, 17 goatholdings and 2 mixed holdings with goats/sheep. Sont concernés : 684 élevages bovins, 17 élevages caprins, le reste concerne les élevages ovins ( 1 128 ). There are 266 UK farms reporting SBV: 44 in cattle and 219 in sheep and 3 premises which reported sheep (earlier in the year) and are now also reporting cattle cases. We have adjusted some of the current total numbers for the counties where some premises lie close to a county boundary. This has no bearing on the distribution of infection when it occurred last summer or on our assessment of the risk of incursion of potentially infected midges from Continental Europe. It is a consequence of more detailed ongoing work following up affected premises in order to assess impact. In Germany animals from 1 627 holdings have been tested positive for Schmallenberg virus so far. The cases occurred in 726 cattle holdings, 854 sheep holdings and 47 goat holdings. Affected federal states are North Rhine-Westphalia (244 cattle, 270 sheep, 13 goat holdings), Lower Saxony (198 cattle, 144 sheep, 6 goat holdings), Hesse (71 cattle, 130 sheep holdings, 9 goat holdings), Schleswig-Holstein (85 cattle, 101 sheep holdings, 1 goat holding), Rhineland-Palatinate (1 Bison holding, 42 cattle, 41 sheep, 5 goat holdings), Baden-Wuerttemberg (7 cattle, 22 sheep, 5 goat holdings), Brandenburg (20 cattle, 21 sheep holdings), Thuringia (25 cattle, 30 sheep, 2 goat holdings), Saxony-Anhalt (11 cattle, 23 sheep, 2 goat holdings), Hamburg (2 cattle, 6 sheep holdings), Bavaria (12 cattle, 17 sheep holdings, 1 goat holding), Saxony (4 cattle holding, 35 sheep holdings), Mecklenburg-Western Pomerania (4 cattle, 9 sheep holdings, 1 goat holding), Saarland (4 sheep, 2 goat holdings) and Berlin (1 sheep holding). [Most of the added infected holdings since the previous update of 26 Apr 2012 (see 20120426.1115024) are attributed to the increase of SBV-related cases in cattle farms, as expected. In France, 206 new infected cattle holdings have been detected since 11 May 2012.</P>The German data on cases in roe deer are noteworthy. It will be interesting to obtain data on SBV and other orthobunyavirus- (e.g. Akabane) related congenital malformations in wildlife from other countries. Testing of cattle-samples from last year revealed positive results of at least 70% . It is not know yet how what % of positive cows had dead and/or malformed calves. The National Veterinary Institute has found antibodies against Schmallenberg virus in samples from two cattle in southern Jutland. This is the first infection with this new virus is found in Danish livestock. Two cattle originating from the same herd in southern Jutland have been subjected to Schmallenberg virus that has spread in Europe since the summer of 2011. This is shown in a survey for antibodies made by the National Veterinary Institute. "This is the first finding that livestock in Denmark has been infected with Schmallenberg virus," says Anette B&#248;tner that veterinarian and head of Section for Exotic Viral Diseases at the National Veterinary Institute. The antibodies produced by the immune system, can be traced in the blood for months after an infection with Schmallenberg virus, and the two cattle were probably infected in the autumn by small mosquitoes - midges. period from 1 June 2011 to 1 December 2011.